Burnished floors are a great option for warehouses, bay floors at Fire Dept, garage floors and basement floors that have no existing sealer on them. 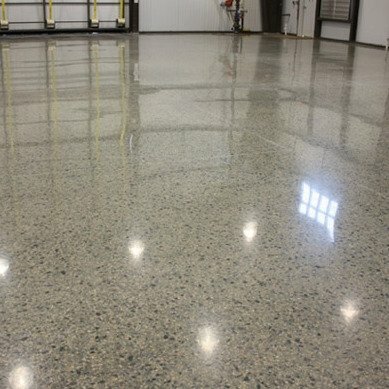 This concrete burnishing process gives standard concrete surfaces a beautiful sheen while providing improved resistance to stains and increases surface hardness. The surface of the floor receives a high gloss sealer and performance densifier which is spread using a microfiber mop pad for an even thin coating. Then a high-speed concrete burnisher will go over the entire surface to fuse the sealer to the concrete. This process creates a gloss finish. Typically two coats are required.